craftytammie: Classic Modern Quilts tour & tutorial! Hi everyone! It's my turn on the Classic Modern Quilts blog tour! My block was the Depression block. FYI, I showed my husband Troy the paper with all of the designs we were picking from, and told him to decide which one I should make. They were all so cool, I just couldn't make a decision! He likes simple, so I think that's what drew him to this block. And this block is super simple. Composed of half square triangles, this is a great scrap buster. I used a charm pack of 2wenty Thr3e by Eric & Julie Comstock (for Moda) to create my depression blocks. 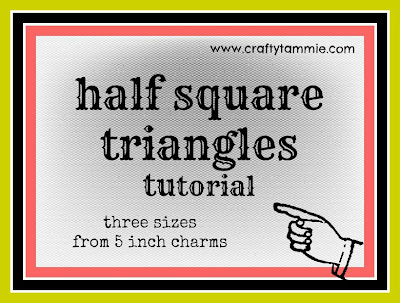 I made all three block sizes out of 5 inch charms, so as promised, here's a little tutorial! The larger blocks are pretty simple, and you probably already know this method. Stack 2 charms, right sides together. Draw a line diagonally, corner to corner, and then stitch 1/4" on each side of the line. Cut on the drawn line, and voila! 2 HST. Trim to 4 1/2" square. The medium blocks are made by stitching around the outside of your stacked charms. Once you've gone all the way around the charms, you will cut diagonally, from corner to corner, in both directions. Pat yourself on the back, you just made 4 HST at once! Trim to 3" square. Then there's the smallest blocks. These finish at 2 inches! Again, stack two charms right sides together. This time, you're going to be drawing two lines, diagonally from corner to corner, making an x. Then you sew 1/4" on each side of both lines. Cut along your drawn lines. You will have 4 triangles that look like these. Cut a line from the long edge to the point of the triangle, lining up the bottom edge with your ruler. 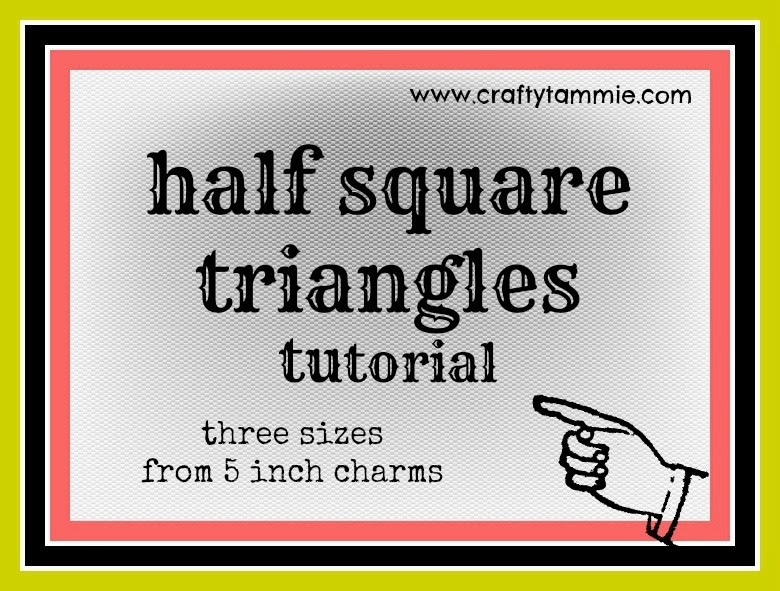 Ta-da, you just made 8 half square triangles at one time! Trim them to 2 inches square. Today my friend Tia and the quilter behind those gorgeous swirls above is also on the blog tour, so be sure to hop over and visit her! 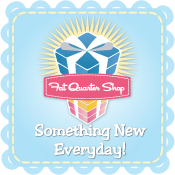 And tomorrow it's Amy Smart's turn, she blogs over at Diary of a Quilter. 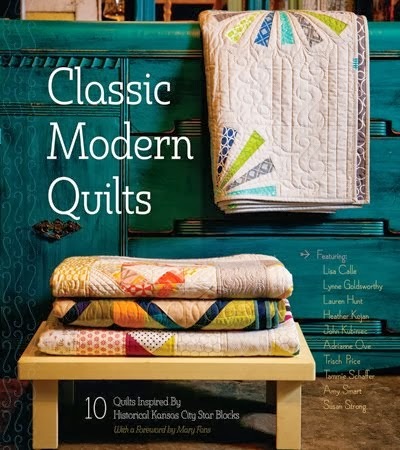 Enter to win a copy of Classic Modern Quilts using the rafflecopter widget below, and if you're the lucky winner you'll be contacted via email next Wednesday! One favorite, you're kidding right? I like Kate Spain, Kate & Birdie, Eric & Julie Comstock, Lotta, Zen Chic, Gina Martin, the list goes on. Aneela Hoey....I've made a quilt with every line of hers but one! Kaffe Fassett is my favorite. Thanks. I think my favorite would be Tula Pink. Right now Tula Pink but it changes everyday. OMG - how can you choose one! My latest this summer was Jenn Ski. She did a line of mod-century fabrics that I used in two quilts for my 1966 Airstream's twin beds. Sooooo cute! To be honest - I don't have one - I'm an all-over-the-board kind of quilter. I have several that are my favorites. I like Minnick and and Simpson, 3 Sisters and French General. Pat Bravo is one of my favorites! GREAT BLOCK!! this blog tour is soo much fun! thx for the chance to win! Quilters today are so fortunate to have so many fantastic fabric designers. One of my top favorites is Kate Spain. There are so many that I love, how can I choose. I love Tula Pink, Riley Blake, Kate Spain and Denyse Schmidt. And…that is just the beginning of my list. I have lots I love. Riley Blake is one that comes to mind. 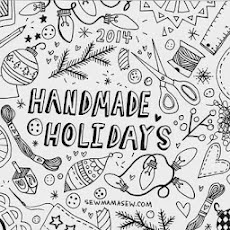 I love AMH and Tula Pink and Denise Schmidt, but also Sweetwater and Zen Chic. Too hard to narrow down! Amy Butler, I have tons of her fabric. I love all the designers! Presently it is Bonnie and Camille, but I also love Aneela Hoey. Riley Blake and so many others! Thanks for the giveaway. Right now it's Jeni Baker! For the moment Denyse Schmidt. AMH is amazing. and I love Tula Pink. I recently fell in love with Sierra Fiesta by Bren Talavera for Robert Kaufman!! There's no way to pick a favorite, but Michael Miller is up there for me. Great HST tips. One favorite- I really don't like those questions. Lotta Jansdotter right this minute. Tula Pink, i can't resist her little hidden treasures in her designs. Looks like an awesome book! So many great designers and hard to pick one, going with Kate Spain. I always love anything and everything she does. Amanda Murphy, Kate Spain, oops that's two, shucks. thanks for a chance to win. I'm liking Bonnie and Camielle right now, bit I like many others. It would be too hard to name just one...AMH & Amy Butler are def at the top of the list. Favorite? That changes so often as I'm enticed. I always come back to Anna Maria Horner! That is such a hard question! How about this--my favorite designer whose fabric I admire from afar but don't have any of? That's Bonnie Christine. Gloria Wall of Winnipeg! LOVE her stuff. I like Jay McCarroll because he's kooky! 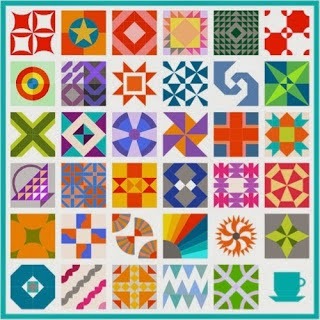 Kaffe Fassett, and Anna Maria Horner ... Thank you for the tutorial and the giveaway! There are so many to chose from - I hunk right now it's V and Co. I love Pat Bravo and Kaffe Fassett! Thanks for the chance! No fair - I am so fickle that my favorites change all the time. If I must choose, though, I guess it's got to be Fig Tree Quilts! That is a hard question! I love many of the designers for Moda Fabrics and it would be hard to say who is a favorite! I also love Riley Blake. I don't really have a favorite. It all depends the project and for who. Rashida Coleman-Hale. I just got a half-yard bundle of Tsuru and I don't know how I'm going to bear cutting it up. You can contact me at elsiesgeekery(at)zoho(dot)com. Bonnie and Camille, Sweetwater, and Sandy Gervais are just some of my favorite designers. Thanks for the chance to win a copy of this great book. Right now Jeni Baker, love her new vintage line. I do not have a favorite. I use hand dyes most of the time. I don't think I could narrow down my pick to just one! Hard to pick just one!! Aneela Hoey, Lori Holt, Desyse Schmidt. Thanks for the opportunity to win this marvelous book. Zen chic. I enjoyed visiting your blog! I like V and Co and Bonnie and Camille. Loving Sarah Jane at the moment, her designs are magical. I would have to say that my favorite at the moment is Kate Spain. My favorite designer is Pat Bravo. Thanks for the giveaway. Today is Denise schmidt but that could change by lunch time. Could be Heather Bailey or Caroline Friedlander or perhaps Sandi Hendersen? Only one? Then it'll have to be Heather Bailey. Or Tula Pink, Amanda Murphy or Allison Harris? I just love Tula Pink fabric. Thank you! 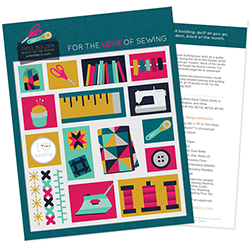 For the Love of Sewing!